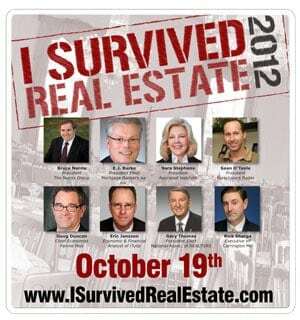 I SURVIVED REAL ESTATE 2012 IS BACK OCTOBER 19TH! The Norris Group’s annual award-winning event returns Friday, October 19, 2012 to the Nixon Library in Yorba Linda, California. We expect another sold out crowd and an incredible info-packed event. We’re once again assembling an incredible panel of industry specialists to discuss the state of real estate during one of the most politically-driven markets of our lifetimes. Will bulk-buying hedge funds block local Realtors and investors from working in the market? Is the robo-signing debacle finally over so inventory can better move through? Are more changes lurking around the corner that can once again change how we do business? These and many more questions will be addressed as we usher in our fifth anniversary of this important event. This year, the focus is kids. We’re currently working with our nonprofit partners on final details but we’re excited to make a difference and we’re hoping you’ll help us make this another huge success. Over the past 4 years, I Survived Real Estate has raised over $250,000 for charity. See the event website at www.isurvivedrealestate.com for registration, event details, speakers, and charities.